Vinegar has been used both internally and externally for thousands of years. Hippocrates was using vinegar to manage wounds in 420 B.C. Today vinegar is used for everything from cleaning windows to treating jellyfish stings. When added to a salad, vinegar provides several health benefits. Vinegar is high in ascetic acid, which can help the body better absorb minerals from food. The Learning Channel reports vinegar may be especially useful to women who have a hard time getting all the calcium their bones need. You can find lots of calcium in dairy products, but many people have trouble digesting the lactose found in milk and other products. Eating a salad with a little vinegar dressing can help. TLC notes that dark, leafy greens are a good source of calcium, but some of these greens also contain substances that make it hard for the body to absorb that calcium. 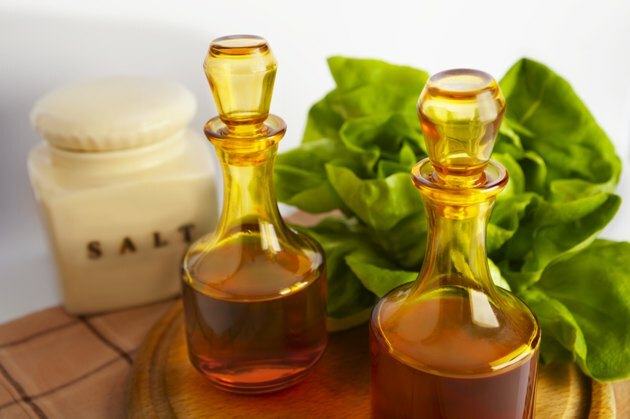 Vinegar dressings may help counteract those compounds, allowing more calcium to be absorbed from the salad. Vinegar shows promise in helping people with type 1 and type 2 diabetes. "Renal and Neurology News" reports that researchers in Greece found that people who ate a little vinegar before their meal reduced hyperglycemia after meals. The investigators noted that using 2 tbsp. of vinegar on a salad could be helpful in reducing hyperglycemia. The Learning Channel notes that vinegar has also shown promise in helping people with type 2 diabetes control their blood sugar levels. A 2004 study cited by the American Diabetes Association found that vinegar helped the bodies of some type 2 diabetics become more receptive to insulin. Many dieters think they’re doing something good for their bodies when they pass up a big meal for a salad. However, many salad dressings are loaded with fat, sodium and calories. Registered dietician Gayle Alleman told The Learning Channel that saturated and trans fats can increase blood cholesterol levels and lots of sodium can be bad for people with high blood pressure. She recommends using vinegar-based salad dressings on greens and making a vinegar-based coleslaw, rather than one with mayonnaise. Can Drinking Distilled White Vinegar Help Me Lose Weight?